About to make a hairstyle change? Your stylist can help! A hairstyle change can be a difficult decision. Figuring out the perfect new style means taking the look, your lifestyle and other aspects into consideration. 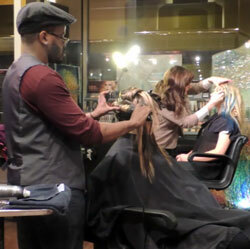 Your XEX stylist is one of your most valuable assets when deciding on a style change. Your stylist has an understanding of your style preferences and hair type, so they can help you determine which new look will serve you best. Here are some things to ask your stylist when you’re thinking about a hairstyle change. Will the style I like work for me? Talk to your XEX stylist about the prep time needed each morning. Does your morning routine allow enough time to make the new style work? Your stylist can also tell you how the style will work with your hair type. A slight variation of the style may help it to look better for you. How short will the new look really be? Sometimes it’s hard to visualize how short a new look will be. Ask your stylist to show you where the new look will sit. You may be visualizing a longer look than the stylist, so discussing the length ahead of time will ensure that you’re both on the same page. What products will be needed for my new hairstyle? If you’re going from a style that takes little maintenance to one that requires a bit more upkeep, it will probably require more products. Talking to your stylist ahead of time about the products you’ll need will help to understand the cost and time commitment needed for the new look. How often will I need a trim? Your stylist can help you understand the growing out process for the new look. Depending on the look, you may need to stop in for a trim more often than with other styles. Understanding the growing out process will help you decide if it is the right time for a particular look. Will it look good on me? A style that works with the face shape or hair type of someone you see in a magazine may not look the same on you. Your stylist will be honest with you. They’ll help you understand how the style may look different on you. They can also suggest similar styles that may compliment your face shape and hair style better. If you’re looking to make a hairstyle change, schedule an appointment with your XEX stylist. Asking these questions ahead of time will ensure that you’re new style is exactly what you want. What products will I need for the new style? What products will I need for the new hair style?